The Facebook-led Telecom Infra Project (TIP) has dropped a big hint that its efforts to build an open ecosystem for the radio access network (RAN) may soon be combined with the work being done by the Open RAN Alliance (ORAN Alliance) in a move that could address some concern about overlap between different industry initiatives. The Telecom Infra Project (TIP) was set up in early 2016 amid frustration about a lack of innovation and high costs in the telecom equipment sector. It has brought together operators, traditional equipment vendors and startups on various projects that are using open source technologies and open approaches to overcome this inertia. Some of its highest-profile activities are aimed specifically at the RAN, where the proprietary nature of several interfaces has stopped operators from using more than one vendor. The most notable is the CPRI (common public radio interface) technology that links radio gear with the baseband equipment used for processing signals. Because of CPRI, operators must usually buy radio equipment from their baseband supplier, say industry analysts. In other words, an operator would be able to buy off-the-shelf radios from a variety of different vendors to go with baseband technology from an entirely different supplier. This would reduce dependency on a single supplier (the dreaded vendor "lock-in") and could promise more competition and lower equipment prices. 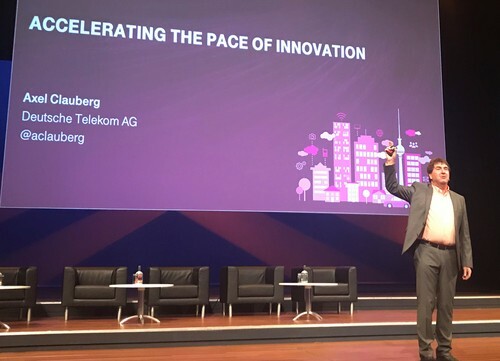 Deutsche Telekom's Axel Clauberg urges collaboration between different industry groups during a recent event in The Hague. In the case of TIP and the ORAN Alliance, a close partnership (but not a merger) now appears imminent, Light Reading has learned. That's because Spain's Telefónica and UK-based Vodafone Group plc (NYSE: VOD), two of the operators involved with TIP's OpenRAN project group, would base their work on the "xRAN" specification developed by the ORAN Alliance, according to Clauberg. "They have not done any specs from the ground up. They have not built architecture but are looking at how the architecture specified by the ORAN Alliance could be built and deployed in a commercial way," he tells Light Reading. "In this area, TIP would do solutions integration and prove it is possible to build such an open RAN in real life." TIP said the next stage would see Vodafone carry out field trials of OpenRAN platforms in Turkey, with Telefónica doing the same in Latin America. The potential emergence of a CPRI alternative and white box market for radio gear is typically seen as a threat to the dominance of Ericsson AB (Nasdaq: ERIC), Huawei Technologies Co. Ltd. and Nokia Corp. (NYSE: NOK) in the RAN market. Yet with so many big operators now demanding open RAN technologies, the move could be hard to resist. The ORAN Alliance's membership list includes AT&T, China Mobile, Deutsche Telekom, NTT DoCoMo, SK Telecom, Sprint, Telstra and Verizon. That would leave Huawei as the only one of the three big RAN vendors on the outside of the ORAN Alliance. Nokia, meanwhile, remains the only one to have joined TIP. Nevertheless, an industry expert who preferred to remain anonymous said there would be a "legitimate concern" about TIP's ability to change the market if it ends up being dominated by the big operators and vendors. The same source had also anticipated a tie-up between TIP and the ORAN Alliance, arguing the latter is now the real driving force when it comes to open RAN technology. In the RAN area, there is some hope the xRAN specification may eventually be adopted by the 3GPP as an alternative to CPRI, although Clauberg resisted any suggested that TIP is competing against the standards body. "I wouldn't say this is competition to 3GPP but it is important to understand the relevance of global standards, because without them we wouldn't have interoperability," he said. "Sometimes there are global standards and you need acceleration and a standard doesn't necessarily say how you should build something. Opening up the RAN is not covered by the 3GPP but by the ORAN Alliance work and what we're driving here in TIP." "CableLabs has done vRAN fronthaul over DOCSIS and BT is pushing for it over G.fast. There are other activities that are complementary to what has been done elsewhere," says Clauberg. "The challenge with fiber is that it is not globally available at the right price."